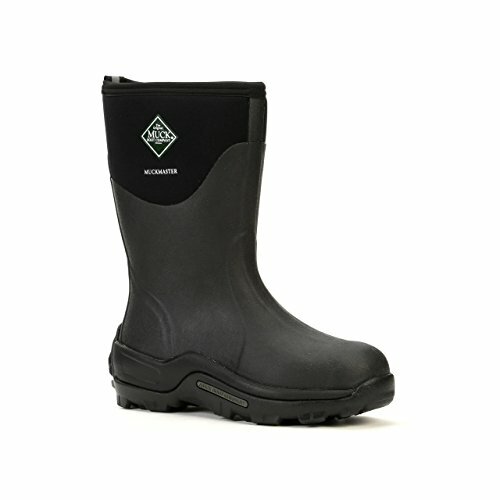 Ideal for farmers and landscapers, Muckmaster Commercial Grade Mid-Height Rubber Work Boots keep you drier with calf-high extended rubber overlays that also resist punctures. Designed for the warmth you need when you spend hours outside, these rubber work boots feature thermal foam under the footbed and breathable Airmesh linings to keep air circulation constant. The CR Flex Foam neoprene absorbs shocks, retains heat and adjusts to the foot's natural shape for exceptional comfort. Finished with molded rubber outsoles, these tall rubber work boots provide improved traction whether you're walking in wet grass or over uneven ground. The Stretch-fit Comfort Topline hugs the calf to seal in warmth and keep out cold and debris.